Dental implants are providing solutions to functional and esthetic problems that patients have faced for decades. One of the biggest misconceptions of dental implants is that they are artificial teeth. They are more like a titanium root which can be used in a variety of ways. The strength and stability of dental implants have allowed us to all but eliminate the poorly-fitting, floating dentures of the past. In their place are an appliance that more closely resembles the function of original teeth. They also provide a means to replace one or two missing teeth with restorations that look and function like the remaining teeth. The photos above are an example of the SMILE TECHNIQUE. This highly-specialized procedure involves the removal of a damaged tooth and the immediate placement of a dental implant. A temporary crown that replicates the exact contours of the natural tooth is fabricated and secured to the implant that same day. The advantage to the patient is obvious; they are never without their tooth. The long-term advantage is that, as the implant heals, the natural contour and position of the soft tissue is preserved. 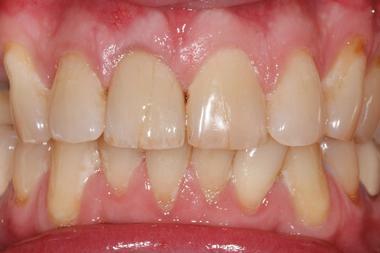 This allows for a more natural and esthetic final restoration that is indistinguishable from the natural teeth. Regardless of the type of implant restoration, the key to success is communication. While many general dentists are currently placing implants, research is conclusive that implants placed by Oral and Periodontal Surgeons have a significantly higher success rate. Dr. David Cross is responsible for the surgical placement of the majority of our dental implants. He shares our passion and commitment to providing the highest level of care available. He is located adjacent to our office, providing us with a distinct advantage in diagnosis, treatment planning and placement. At this time our doctors are certified for the restoration of dental implants from Nobel Biocare, Straumann and 3i. The type of implant selected is based upon the location in the mouth, the quality of the bone and the final restoration to be placed. 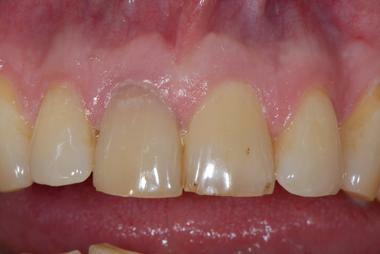 Additional photos of completed implant cases can be viewed in our Smile Gallery. Looks can be deceiving. This patient’s right central incisor is fractured below the gum line. The tooth was replaced with a dental implant utilizing The SMILE Technique. The surgery was completed by Dr. David Cross and the final restoration by Dr. Maggiore. The final crown is indistinguishable from the natural teeth. Do you want a personalized treatment plan?